The fish community in the diversion reach of the Kokish River is dominated by Steelhead Trout and Coho Salmon. Their anadromous life histories present a challenge for assessing the Kokish River hydroelectric project-related effects on fish production. Juvenile Coho Salmon and Steelhead abundance in the stream can also vary from year to year depending on ocean survival, fishing pressure, spawning success, availability of freshwater juvenile rearing habitat, and other factors that complicate fish community monitoring. Does abundance of Steelhead and Coho juveniles decline following construction of the project, and if so, is the change related to the project? Does individual health (as indicated by growth and condition) of Steelhead and Coho juveniles decline following construction of the project, and if so, is the change related to the project? Does food production for fish decline following construction of the project, and if so, is the change related to the project? We designed a long-term fish community monitoring program to address these challenges and to evaluate the client’s questions. We designed our studies to detect differences between baseline and post-construction conditions and to provide a more reliable estimate of the productive capacity of the stream. To address environmental factors, we sampled a nearby control stream (Tsulton River) using the same methodologies to help provide a relative comparison. Monitoring methods to assess abundance of juvenile fish are comprised of snorkeling for enumerating parr (age 1+, 2+, and 3+) and electrofishing for enumerating fry (age 0+). Snorkel observer efficiency and electrofishing capture efficiency are determined using mark-recapture techniques in order to estimate population size. Individual fish data is collected to determine biomass, size-at-age, and condition. 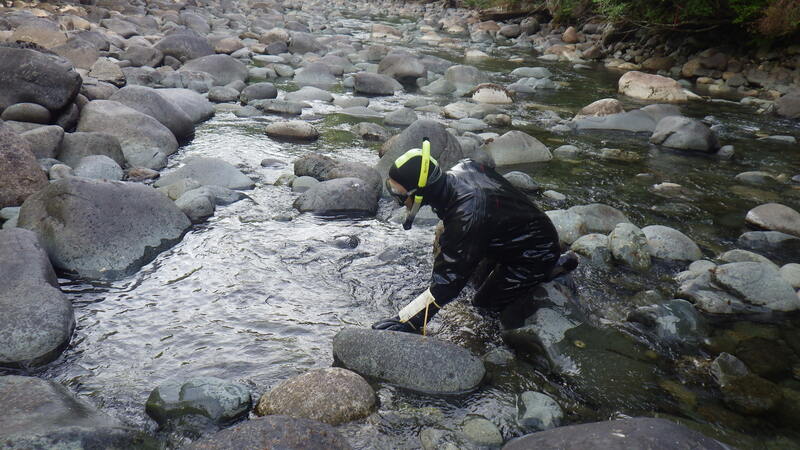 The density, biomass, and community composition of macroinvertebrates is assessed by capturing invertebrate drift using nets that sample a known quantity of water. In addition, juvenile fish migration has been monitored using rotary screw traps and video surveillance of the Coanda and fishway at the intake. Adult fish abundance and migration is also assessed using a combination of snorkel surveys and underwater video surveillance of the fishway at the intake. The studies were designed to detect differences between baseline and post-construction conditions and to provide a more reliable estimate of the productive capacity of the stream. To date, two of the five years have been completed.